It is the belief of millions and millions of devotees that Devi Kali removes Obstacles, Hurdles and Dangers. People who are facing obstacles, constant hurdles or feeling something dangers may happen ahead may go for offering Maha Kali Homam. You may also opt for this Mahakali Homam if you feel you are facing intense Problems or may feel something danger may happen ahead. It is said that Devi KALI Kills your bad time and Negatinve effect of Life. It is also said that offering homam to Devi Kali gives you protection, success and prosperity ; removes obstacles and nullify the effect of your enemies works against you. Offering Homa to Devi Maha Kali removes Distress, Evil forces around you, blockage (that hinder your success), Blackmagic, Evil eyes on your family and bring Victory in your work and derive Success & peace in Life. Devi Kali or Mahakali - the Consort of Mahakal (Lord Shiva) is the Symbol of Strength who takes all the Pains of a devotee and gives pleasures in return. People go for Maha Kaali Homa for removing the fear, the effect of bad persons' evil forces or Black magic from their entire family. Also for bringing peace and happiness in their family or individually. To diminish our ego and all negative tendencies that hinder spiritual progress and material prosperity. 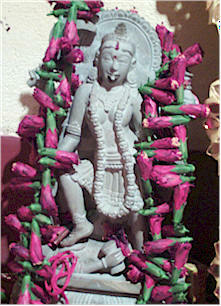 Maha Kali is the symbol of shakti (Strength). She is the consort of Lord Shiva. 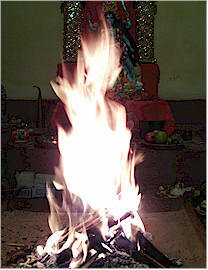 Thus the Mahakali Homa is also done for getting Strength and power in mind. This is the spiritual process that may remove your any sort of obstacles and derive Success & Victory in life. The person who is undergoing the Main Phase or internal Phase or Sub-phase of Shani (i.e. Shani Mahadasha, Shani Antar Dasha or Shani Pratyantar Dasha) and also Shani Saade Sati in his / her Horoscope, should offer Puja or Homam to Devi Kali along with Shani Puja to minimize or to get rid of the Shani malefic effect on him / her. After this homa, Holy Puja is held periodically for you for next 1 month to Maa Kaali. You can include all family members in a single order.